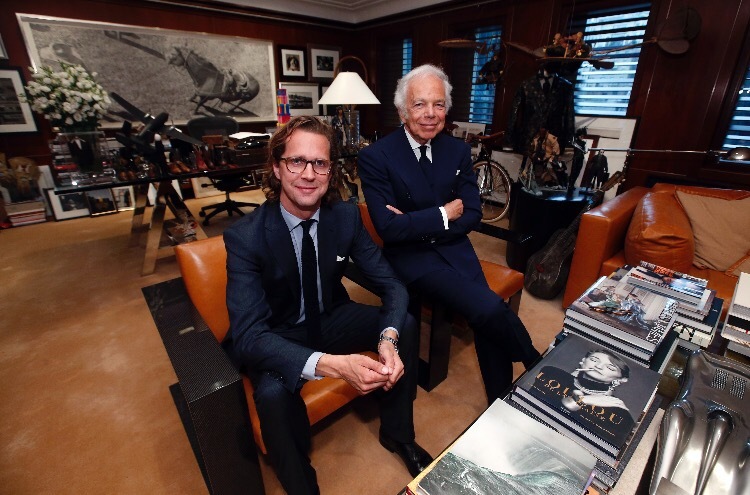 Designer Ralph Lauren, right, poses in his office with Stefan Larsson, global brand president for Old Navy, Tuesday, Sept. 29, 2015, in New York. Lauren is stepping down as CEO of the fashion and home decor empire that he founded nearly 50 years ago, and Larsson, who has been the global president of Old Navy for three years, will succeed him. Ralph Lauren unveiled plans to cut jobs and close stores as the luxury brand struggles with a prolonged period of weak sales. The apparel maker and retailer also disclosed sales targets for the year that missed Wall Street’s expectations, news that sent shares lower on Tuesday. The company said it would book charges of up to $400 million, with a bulk of those expenses tied to lease terminations, store closure costs and severance expenses. Under the plan, Ralph Lauren RL -1.68% said it would also simplify the company’s leadership by moving from an average of nine layers of management to six. While Ralph Lauren didn’t disclose specifics, the company told The Wall Street Journal that it would close 50 stores and cut 1,000 jobs, or 8% of the full-time workforce. Ralph Lauren also projected fiscal-year net revenue would post low double-digit declines, citing store closures and a weak retail environment in the U.S. Analysts had projected a far more modest 4% decline. First-quarter sales are also expected to be soft. Posted on June 7, 2016, in #international, #luxury, #retail, Other. Bookmark the permalink. Leave a comment.